It's not all work work work! The local engineering society (Norwich Engineering Society) uses our facilities and expertise when judging their Phil Bailey Award. 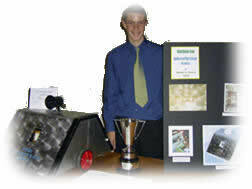 This award is an inter-schools competition to find the best invention/engineering project. The Norwich Engineering Society's Phil Bailey Award was established in 1969 and is given annually to GCSE pupils whose project is judged to have particular merit in terms of originality, design, quality of construction and potential application in the world of engineering. We have sponsored the Hellesdon Youth under 14's football team for 4 years now. They finished 3rd in the Norfolk boys league last season having also played in an international tournament in Holland coming 7th which was an excellent result. Their success is owed to the continual commitment from their trainers and the boys' enthusiasm and sprit to win every match. We have our own enthusiastic and moderately successful raft racing team. They have competed in local events on rivers as well as on the sea! They have won numerous trophies for first second and third, and have gained a local reputation for being the pirates of the high rivers, (and having a water cannon that can shoot water for 20meters at 15lts/sec!). Their unique Hawaii-5-O style not only proves successful, it also proves that they are community spirited, please cheer them on if you see them go by. Being an equal opportunities employer, we extend that to being an equal opportunities sponsor! They haven't had such a successful last season but did play at Carrow Road (Norwich City's home football ground) but unfortunately lost - not too dissimilar to the home team there! 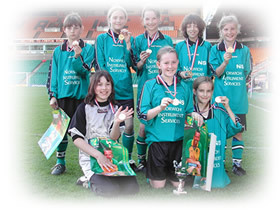 Taverham girls have been training hard and hopefully this season they will do well, with the continual support of NIS. NIS tries to help the local community projects where ever possible and recently donated surplus office furniture to grateful local first and secondary schools. We are all too aware of the serious financial pressure that local authorities are under and small projects like this go a long way to helping out where possible. The local community is important to NIS and we try and help out where we can - as the saying goes - its not all work work work!